Endogenous growth and stock returns volatility in the long run (C. Faugére, H. Shawky). A note on the Markowitz risk minimization and the Sharpe angle maximization models (C.W. Yang, K. Hung and F.A. Yang). Optimal hedge ratios and temporal aggregation of cointegrated systems (D. Lien, K. Leggio). Market timing, selectivity, and mutual fund performance (C.F. Lee, L. Li). Sources of time-varying risk premia in the term structure (J. Elder). Stock splits and liquidity: evidence from American depository receipts (C.X. Jiang, J.-C. Kim). Portfolio selection with round-lot holdings (C.C.Y. Kwan, M. Parlar). Defining a security market line for debt explicitly considering the risk of default (J.L. Heck, M.M. Holland and D.R. Shaffer). Shareholder heterogeneity: further evidence (Y.T. Lee, G. Liaw). The long-run performance and pre-selling information of initial public offerings (A. Chen, J.F. Cotter). The term structure of return correlations: the U.S. and Pacific-Basin stock markets (M.-S. Pan, Y.A. Liu). 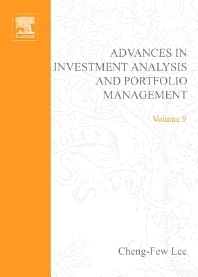 Characteristics versus covariances: an examination of domestic asset allocation strategies (J. Fletcher).